For runners with flat feet it’s important to have shoes with a proper support system. It will prevent potential injuries and help your form. 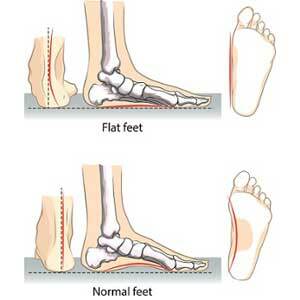 Flat feet is a condition when the foot arch collapses and is sitting on the ground completely. The foot arch helps in absorbing the shock of the foot landing on the ground. But for flat footed runners the arch collapses and the whole bottom of the foot gets into a connection with the surface. Frequently, flat feet and low archFgood are associated with overpronation, which means that the foot rolls inward too much. You can check if you over pronate just by looking at your footwear. Of the inner side is more worn out, then you are probably over pronating. So if you have fleet, you should starting looking for good running shoes or good walking shoes that will provide the proper support and keep your feet comfortable even during long runs. But what are the best running shoes for flat feet?  Below you can view the top products in 2018. Under the chart and reviews you can also check more information on the flat feet condition, as well as the buying guide and other tips. If you would like to check product prices, you can follow the image links in the table to either models of men’s running shoes for flat feet or women’s running shoes for flat feet. 13 What Is a Flat Foot? 16 How to Treat or Prevent Flat Feet? 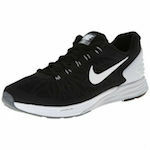 Nike Lunarglide 6 is the highest rated stability shoe from this brand and it’s also best overpronation running shoe. It’s a lightweight trainer that provides a good customized fit. Throughout the entire sole it has Lunarfoam, which adds enhanced cushioning , good shock absorption, and stability. 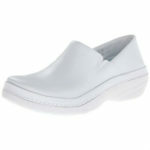 This engineered foam conforms to your foot for a secure and comfortable fit. 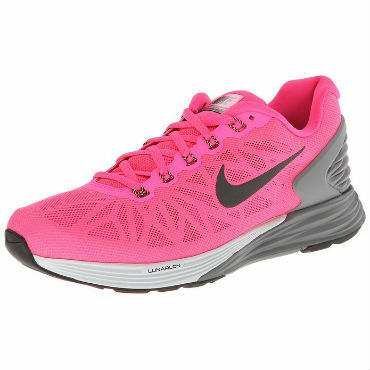 The Lunarlon also has a more stable outer layer for greater stability of the athletic shoe. The reinforced midsole area provides great overpronation protection. The Dynamic Support system of the midsole along with the dual-density cushioning provides a plush platform with a sufficient medial support. A crash pad at the bottom of the heel provides additional support and helps correct overpronation. Flex grooves allow good flexibility of the running shoe and provide smooth foot strike transition. The upper is made of seamless mesh, which makes the Lunarglide 6 more lightweight. It also ensures that your feet remain cool during hot weather. The Lunarglide 6 features Flywire cables that cover the whole length of the foot and connect to the sole unit. This also provides additional support and allows to run long distances. This athletic shoe is also designed with a Pressure Mapped Outsole, which provides better traction and allows comfortable running and walking on various terrains. The shoe also makes a great choice for cross training. Pros: lightweight; enhanced Lunarfoam cushioning; good traction provided by Pressure Mapped Outsole; support provided by Dynamic Support system, crash pad; flexibility provided by flex grooves; breathable seamless mesh upper; plenty of room in the toe box. Cons: might not fit people with wide feet. CHECK THE LATEST PRICE FOR MEN’S! FOR WOMEN’S! Another pleasantly lightweight shoe that is great for flat feet is the Asics Gel Super J33. 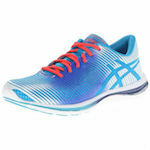 It’s also a stability running shoe and comes from the Asics’ series that are designed to promote natural running. 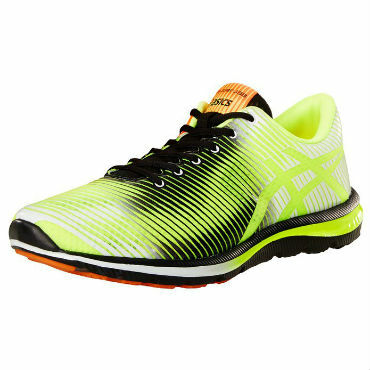 The midsole construction is designed with the Asics’ Fluid Axis technology, which features flex grooves that cut the midsole lengthwise. The benefit of this technology is promotion of natural foot motion and smooth transition. So the flex grooves on one side help the foot to pronate naturally, while on the other side (in the medial side of the midsole) a layer of harder foam prevents the foot from over pronating too much. The outer sole is made of textured lugs and includes Gel cushioning, which allows the feet to bounce off the ground increasing the running speed. The light mesh upper is wrapped with a series of welded overlays. Around the tongue there’s a number of simple metal eyelets. The Asics Gel Super J33 offers a nice fit with a good wrapping in the middle of the foot and a more roomy toebox for flexing your toes. 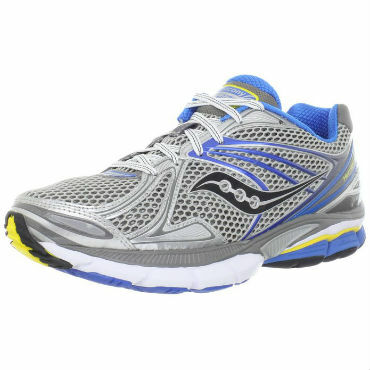 Pros: one of the lightest stability running shoes; flexibility provided by Fluid Axis technology, Solyte Midsole, and the smooth upper; Gel cushioning in the sole that is firm and at the same time responsive and supportive; good stability for overpronators provided by denser foam on the medial side of the shoe; roomy toebox; stylish design. Cons: people with wider ankle might find the heel fit to be a bit slippy. 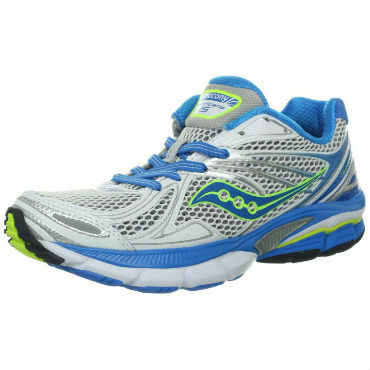 Saucony Hurricane 15 running shoe is a solid stability shoe, which is also recommended for runners who tend to over pronate. They are slightly heavier, but not clunky, and are still perfect for speed work, long distance running, and good long workouts at the gym. The outsole is made from carbon rubber compound that is known to provide excellent traction and high wear resistance. It also features an IBR+ outsole in the forefoot area, which is a new injection-blown rubber compound. It is lighter and provides better energy absorption and improved cushioning. The midsole has dual-density foam that gives excellent comfort for each step you take. It also features a PowerGrid technology with a medial post that provides medial support and impact distribution, and as a result reducing overpronation. The Saucony Hurricane 15 athletic shoe uses 3 cushioning technologies that include Impact Interface, SRC Impact Zone, and the PowerGrid. The purpose of the SRC (Super Rebound Compound), which is located in the heel, is to reduce the shock that is transmitted from impact to the body and sets the foot up for a smooth transition. The Impact Interface cushions and isolates the heel-strike impact. This allows the heel to compress without bottoming out. PowerGrid runs through the full length of the midsole providing excellent cushioning and support. The flexible and breathable upper is made of dual density mesh. This workout shoe uses a Sauc-fit saddle. It ensures a secure fit and provides independent movement of the heel and forefoot. Pros: flexibility provided by flex grooves, Sauc-fit saddle; cushioning provided by PowerGrid, Impact Interface, and SRC Impact Zone technologies; support provided by dual density foam and PowerGrid; excellent shock absorption; 8 mm heel-to-toe drop gives better stability and more midfoot strike; medial post promotes natural pronation, which is beneficial for flat feet (fallen arches). Cons: a bit steep price tag. 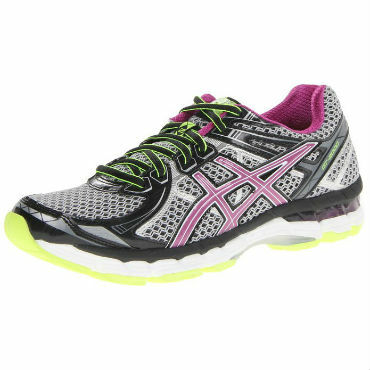 The Asics GT 2000 2 is a well balanced shoe and is great for those looking for stability, good arch support, and a comfortable upper. 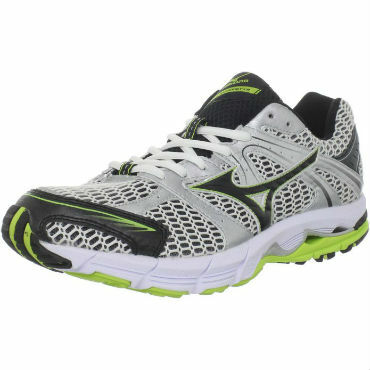 The midsole features a FluidRide technology that provides a bouncy underfoot comfort and supportive cushioning in the midsole and the underside of the running shoe. At the same time it’s lightweight and very durable. The structure system of the workout shoe includes a Trusstic system for midfoot structural integrity and enhanced gait efficiency and a Dynamic DuoMax heel pad for enhanced stability and support. The outsole is made from high abrasion rubber that enhances durability. The forefoot and rearfoot feature Gel cushioning that attenuates shock during impact and allows smooth foot transition through the gait cycle. The Guidance Line technology in this involves flex grooves that run from heel to toe. They improve flexibility and gait efficiency. A stiff internal heel counter provides the needed rearfoot support. The upper is composed of an air mesh and interconnected welded overlays. There’s good ventilation and flexibility. 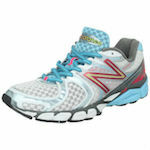 The women’s model features a midsole with a lower density top layer, giving female athletes better midsole compression. Pros: good arch support provided by FluidRide technology and Trusstic system, and Dynamic DuoMax heel pad for the heel support; good ventilation and flexibility provided by the air mesh; rearside and forefoot Gel cushioning; flexibility with flex grooves from heel to toe; smooth foot transition. 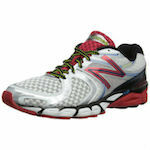 New Balance M1260v3 was designed for people with flat feet and overpronators. From heel to toe it features great cushioning distribution. The running shoe is designed with New Balance’s Acteva Lite midsole technology, which is a lighter than standard and extremely durable foam. It provides optimal cushioning and resistance to compression of the foam. The midsole is also enhanced by N2 technology, which is designed to maintain a high level of cushioning, but at the same to shed unnecessary weight and bulk. This technology uses less underfoot material, though with still sufficient cushioning and a good level of impact absorption. So while providing all the comfort and support, the shoe keeps the weight super light. While the midsole gives a quite soft feel, a strong post within the foam also provides great support to help prevent overpronation and support the arch of the flat feet. The offset heel counter with an 8 mm heel-to-toe drop off also help to correct the flat feet condition. The optimum support is also provided by the T-Beam shank, which is located in the midfoot of the workout shoe and provides crucial torsional stability and arch support. Pros: durable blown rubber outsole, great support with the T-Beam shank, strong post, N2 cushioning, and good offset heel counter; very lightweight; breathable air mesh rubber. Cons: styling is not for everyone. 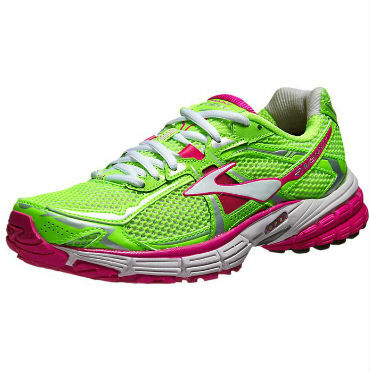 Brooks Ravenna 4 provides an amazing balance of cushioning and pronation control, making it also one of the best running shoes for overpronaiton. 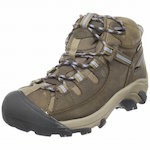 It features a traditional look and provides decent comfort and performance for an affordable price. 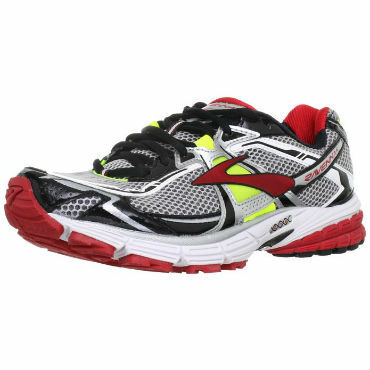 This running and gym shoe features a construction of a traditional stability shoe. The midsole is made of the BioMoGo foam. It’s an innovative compound designed by the Brooks brand as the first biodegradable midsole foam. It offers the same cushioning and performance as standard midsoles, but with this technology it breaks down 50 times faster, making it more durable. The foam of the medial side has a dual density insert and a solid midfoot shank that provide the needed arch support for the flat foot. The heel crash pad also provides support and a smooth heel laydown. To prevent the foot from collapsing in, this athletic shoe features a cushioned, external part of the heel. The shoe also prevents collapsing of the arch with harder foam that is located right under the arch. Also, the flat foot bed is perfect for flat feet. The use of DNA cushioning the forefoot and rearfoot provides good resilience and adaptive cushioning that adjusts to your feet. Omega grooves are designed to increase natural flexibility. 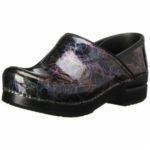 An arch saddle made of dynamic stretch material wraps the instep and secures the foot. Pros: adaptive DNA cushioning; smooth heel laydown; adjustable arch saddle makes the workout shoe perfect for different foot types; BioMoGo foam boosts cushioning and increases durability; break down quicker; breathable mesh upper; high traction on the soles; great arch support; good value for the price. Cons: a bit heavy, not very roomy toebox. 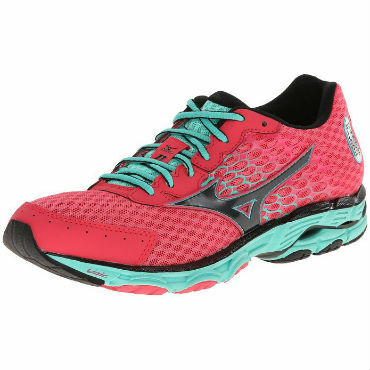 Mizuno Wave Inspire 11 is a sleek looking athletic shoe that gives a balanced ride, great responsiveness, and is perfect for people who overpronate, have flat feet, or a low arch. The platform provides a light, stable, and quick run. It features a Wave plate that is designed to absorb the shock as your foot touches the ground and disperses the impact forces away from the foot. This plastic plate provides effective cushioning and keeps the foot centered in the shoe. For stability, the plate also features open holes on the lateral heel. For extra rigidity under the heel and support of the arch, the medial side of the plate is reinforced with a wave design. The midsole is made from lightweight U4ic material, which provides a better ride, durability, and shock absorption. A network of grooves improves the smooth transition. To further reduce shock, in the heel there’s a wedge of SR foam. The air mesh upper keeps the feet cool and dry. Additionally, OrthoLite Sockliner provides a softer feel and gets rid of moisture inside the shoe. 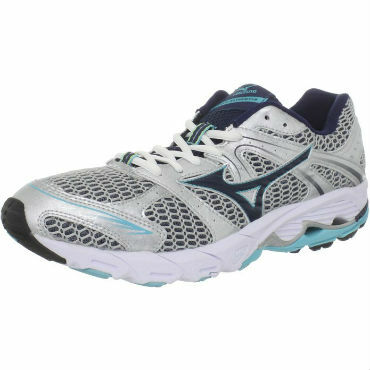 Pros: light on the foot; responsive and cushioned ride; roomy upper fit; good support with the Wave plate design; soft yet responsive ride; smooth toe-off. Cons: the price is a bit stiff; breezy upper construction. 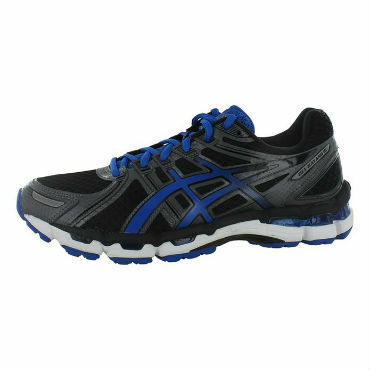 Asics Gel Kayano 19 motion control shoe is also one of the lighter stability shoes with the perfect balance of cushioning and support. 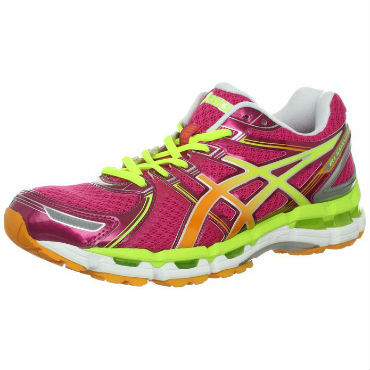 The athletic shoe features a pronation controlling midsole foam called Dynamic Duomax. Compared to the previous Duomax system, this firmer density medial post system provides a softer correction for the over pronating foot by stopping the excessive inward roll. The rest of the midsole is comprised of the SoLite foam, which gives a cushioning, but is not too soft and retains a good level of responsiveness. Between the midsole layers there are Gel pods. A larger one in the heel and three smaller ones in the forefoot. The heel also has double layers of friction reducing memory foam. The midfoot shank supports the arch and provides a good level of torsional stability of the shoe. The outsole is comprised of blown rubber lugs that are separated by flex grooves. The guidance line runs longitudinally through the forefoot, steering the foot and providing additional midsole flexibility. The upper is made from seamless synthetic and TPU overlays. It’s well gripping and offers a customizable fit. Pros: great cushioning, that is soft but responsive; the redesigned upper helped reduce the shoe weight and provides an improved fit; use of plush materials; roomy toe box; more flexibility and smoother transition. Cons: external heel counter is not very supportive. Brooks Beast 12 might not be the lightest running or workout shoe, but it’s also a great choice for heavier runners with flat feet (fallen arches). This motion control shoe is also suitable for severe overpronators. The outsole material is abrasion resistant rubber that provides durable traction. Additionally, in the forefoot it features Flextra rubber for flexibility and eco-friendly HPR Green rubber for improved skid-resistant traction. The BioMoGo midsole is made from biodegradable materials and offers great cushioning and shock absorption. The midsole also comprises of Flex Grooves that add to the flexibility of this athletic shoe. A DRB Accel unit made from thermoplastic polyurethane is placed in the midfoot and provides torsional rigidity and balanced support. Through the length of the shoe there’s DNA cushioning that cradles your feet and provides customized support for each of your steps, pace, weight, and running conditions. The breathable mesh upper manages moisture and provides a comfortable ride. Also, the sockliner additionally gets rid of moisture and offers more cushioning. Pros: exceptional comfort; highly durable; good traction with excellent grip on the ground; offers great control and proper arch support. Cons: a bit heavy; might not be a good fit for people with wide feet. If you are looking for the best shoes for fallen arches, you should also consider this model. Mizuno Wave Alchemy 12 is one of the most popular and lightest motion control shoes. They are designed with the podiatric needs of the runner in mind and a perfect fit for flat footed runners. 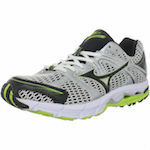 One of its standout features is the medial supportive wave plate. The plate extends from the heel trough the midfoot and offers good overpronation support and support for the arch of the flat feet. It slows the inward roll of the foot and provides a stable platform for toe-off. The Wave plate also effectively disperses impact shock. For shock absorption in the heel area, the Wave Alchemy 12 features a VS-1 cushioning compound. The midsole is also comprised of AP+ foam, which gives a bouncier feeling and extends cushion durability. The mesh upper provides good air flow. The Intercool technology in the sole of the athletic shoe also aids in ventilation and removes heat and humidity from the foot. Most of the people who use this shoe for running, gym workouts, or cross training, love the comfort it provides. Pros: comfortable ride; good moisture management of the upper; lightweight; Wave plate design for arch support, shock dispersion and cushioning. If you’ll look at the person’s foot from the inside, there should be an upward curve in the middle, which is called an arch. It is formed by tarsal and metatarsal bones. The arch attaches to the heel and foot bones with tight bands called tendons. If you don’t have a distinct curve on the inner side of the foot, then you have a low arch. If your arch is sitting on the ground completely, then you have a collapsed arch or flat feet. You can easily check if you have flat feet or a low arch with this wet feet test. Follow these three steps. Simply get your feet wet. Stand on a flat surface. You can use the floor or a sheet of paper. Look at the footprint you left. If it shows a complete imprint of the sole of your feet, then you’re likely to have flat feet. If you see the inside curve of the foot missing, then you have a normal arch. There can be a variety of causes. Many children also have flat feet or a fallen arch. But as they grow older, their arches develop. The following are some of the common causes for flat feet or fallen arches. How to Treat or Prevent Flat Feet? Wearing comfortable shoes. It’s important that they have good support for the arch and help stabilize the heel. For additional arch support you can wear orthotics. They will minimize pressure in the foot, add support, and help to realign your foot’s ankle joints. If your running, walking, or gym shoes don’t have sufficient arch support, you can use arch inserts. They will also help to support your feet and alleviate the pain of flat feet. For those who suffer from flat feet, walking around over long distances throughout the day can cause discomfort and pain. If you struggle with problems caused by flat feet you may find that arch support insoles can offer immediate comfort. Gel insoles are a popular choice when it comes to modern arch support. They offer good support whilst being comfortable to wear too. Gel is shock absorbing, making these kinds of insoles perfect for those with flat feet. You should remember that although arch support insoles may seem to offer immediate relief from any discomfort caused by flat feet, you should try more long term remedies for healthier feet including exercising to strengthen the muscles in the soles. A compression foot sleeve is a medically approved brace that can help to ease the pain caused by flat feet. The way that these medical aids work is that they provide warmth and support to the foot during daily activities. Warmth helps to ease the muscles in the feet and to offer comfort. Support is necessary to keep the muscles in the foot aligned. Flat feet are usually caused by the muscles in the arches being too weak to support the foot properly. Compression foot sleeves are a popular choice as they are a simple and instant remedy. They are lightweight too, which means that they will not cause your feet to feel too heavy and weighted down whilst you are wearing them. 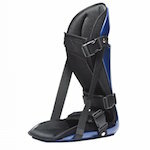 In addition, they are also highly affordable, making them available for anyone who suffers from flat feet. If you really want to strengthen the muscles in your feet, you should try some proven exercises that will help shape your flat feet. The main problem that people with flat feet experience is that the support from insoles and specially designed shoes don’t allow their feet to have the proper exercise that they need. This means that the problem of flat feet never has a chance to correct itself. Instead, there are some things that you can do. First of all, you should try to walk around barefoot as often as you are able to. This will remove any cushioning and support provided by shoes so that your muscles will have to do some work, and in time, this will encourage the muscles to strengthen, reshaping the arches. In addition, you should try to stretch your toes forward and try to hold that stretch for a few seconds before relaxing your feet again. Repeat this around 10 times a day. Walking around on your tippy-toes for just a few minutes a day can also have great benefits for the feet. Spreading the toes is a function that helps to stabilize the feet and to keep the foot balanced and in line. If you have flat feet however, you will often find that you can’t spread your toes out, or if you can, it will be with great difficulty. The loss of the ability to spread one’s toes is caused by a weakness in the intrinsic foot muscles. As well as the muscles in the arches becoming weaker and loose, other adjoining muscles can also become affected. If you can strengthen up the muscles in the arches, the shape of the sole of your foot will improve, and with that, you will find that you will be able to spread your toes again. This will lead to better overall foot health and less risk of pain. If you are able to spread your toes at all, you should use this is as a strengthening exercise for flat feet. You should sit or lie down so that you are comfortable and then stretch out your toes as wide as you are able to. It is best if you can make spaces between your toes as you do this. Once you have spread your toes out, hold them like that and count to 10. You can now relax again. Repeat this exercise around 10 times a day for both of your feet and you should notice results in a few weeks. As loose ligaments in the arches of the feet cause flat feet, it can actually be counterproductive to wear special shoes for flat feet all the time. If your feet are relying on arch support all of the time, they simply have no reason to improve. The muscles will stay just as weak and cannot become stronger for as long as you wear the supportive shoes. Although you may feel that the extra support brings you more comfort, there are other things that you can do to correct flat feet. Walking in the sand is a great exercise that you can do. If you live close to a beach, you should try to walk on the sand often. Walking barefoot along sand will encourage your feet and the ligaments in them to work harder, and this will help the arch to strengthen up and regain its shape again. The more often that you can walk barefoot on a softer surface such as sand, the better the results will be. One of the main reasons why people develop flat feet is due to being overweight. If you carry excess weight, you will find that a lot of the extra weight will be on your stomach and generally to the front of your body. In order to stay upright as you walk, there will naturally be more of a strain on the ligaments of your feet. This can eventually cause the feet to flatten and spread, losing the shape of the arch. The loss of strength in the muscles of the arches that is caused by excess weight bearing down on the soles of the feet causes the shape to be lost in the arches. If you want to improve the health of your feet and give your arches a chance to recover, you could consider losing weight. Think about eating more healthily and exercise more so that you can shift the pounds and your feet will be able to recover. If you are looking for the best running shoes for flat feet or a low arch that will give you a perfect fit, here are some of the things good running shoes for flat feet should have. Support. If you see in the specifications added support, you are headed in the right direction. The support should be for the midsole and the heel. Support is important as the flat footed arch does not provide sufficient cushionign. Stability. The shoe should help to stabilize the foot and stop overpronation by slowing down the inward roll of the foot. Motion control. An important feature for severe overpronators as it restricts extra motion of the feet. Stability shoes. 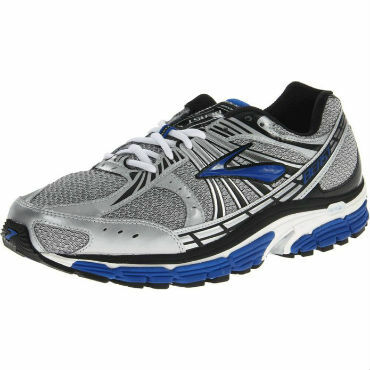 These shoes are good for those who have mild to moderate overpronation. They usually have layers of polyurethane material that creates more support and stability in the area of the arch. They also have a firm medial post that reinforces the arch side of the midsole. This type of shoes helps to correct overpronation by restricting excessive motion of the foot. Motion control. Suitable for runners with moderate to severe overpronation. They feature a stiffer heel and also more support in the arch side, which also prevents the foot from rolling in. So for flat footed runners, to help correct the condition and prevent further injuries it’s advisable to find more comfortable workout shoes with the added arch support. If you have flat feet, we recommend you also to check out other types of shoes that are designed to help you with the condition of a fallen arch. Here our pages for work boots, dress shoes, and tennis shoes for flat feet. If you have extremely flat feet, you can add inserts for additional support. Having proper running, walking, or workout shoes will reduce your chances of injury and provide better comfort. If you want the best running shoes for flat feet, the models above are definitely worth taking a look at. They have all the features that will be beneficial for your flat foot, including most important features such as support and stability. Flat feet or low arch can cause another common foot problem called plantar fasciitis. We have also prepared for you an articles with reviews of the best running shoes for plantar fasciitis that are the top rated products on the market. Other common problem is a high arch, our article on the best products for this condition you can check by following the link. © 2015 - 2016 Your Comfy Feet. All Rights Reserved. yourcomfyfeet.com is a participant in the Amazon Services LLC Associates Program, an affiliate advertising program designed to provide a means for sites to earn advertising fees by advertising and linking to amazon.com.